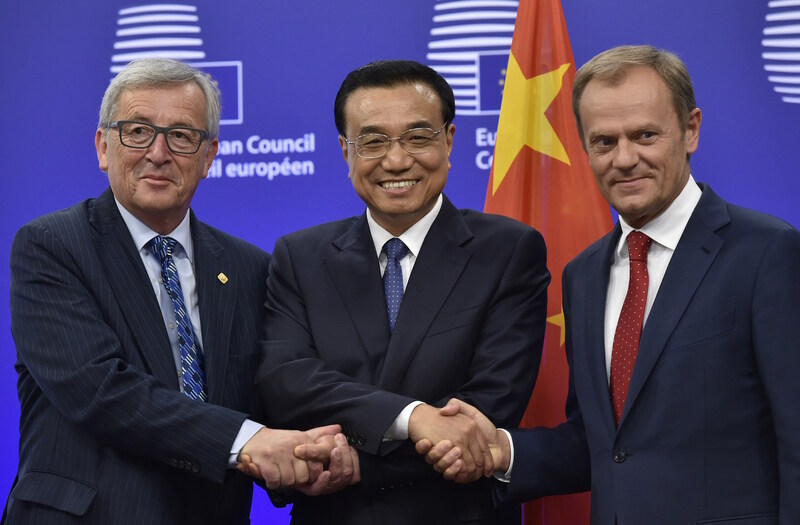 From left to right, European Council President Donald Tusk, Chinese Premier Li Keqiang and European Commission President Jean-Claude Juncker in Brussels on April 9. Chinese Premier Li Keqiang told European leaders state subsidies were for protecting workers and not a form of illegal support for industries as he defended China’s industrial practices from criticism. 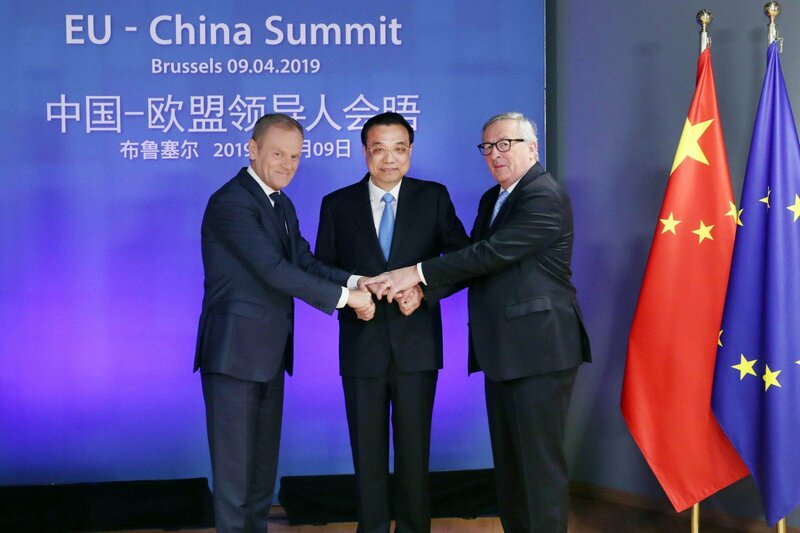 In a summit with EU leaders on April 9 in Brussels, Li called on the bloc to treat Chinese companies as it would treat its own. “Some of the subsidies we give are for laid-off workers, so that they do not lose their livelihoods,” said Li, answering questions from journalists at a press conference to conclude the summit. “They are not for industrial competitiveness.” Li said that China respected World Trade Organization (WTO) rules and would work with the EU and other entities to reform it and address the issue of subsidies. The agreement on subsidies included in the final statement was described as a “breakthrough” by European Council President Donald Tusk at the same press conference. “For the first time, China has agreed to engage with Europe on this key priority for WTO reform.” Tusk said that he hoped talks on subsidies would progress speedily before the G20 summit in Osaka, Japan, in June, where China is likely to face again pressure from major economies. “This year’s joint statement is quite different from previous years’, which were always just vague announcements of intent without any plan of action,” said Ding Chun, Economics Professor at the Center for European Studies at Fudan University in Shanghai. “The EU has been growing increasingly impatient with China’s attitude, but this time China has responded.” Finally, China agreed to provide concrete timelines for the implementation of the reforms it had promised. By the end of this year, China and the EU would agree on a list of geographical indications, a scheme by which the EU seeks to protect its farmers by giving labels to products whose qualities are linked to their specific geographical origin, for example Champagne or Parmesan. An investment agreement between China and the EU would also be signed “by the end of next year, or earlier”. Jo Leinen, Chair of the European Parliament’s delegation for relations with China, regarded these promises as a consequence of the EU’s tougher stance, the South China Morning Post reported. The Spanish Ambassador to China, Rafael Dezcallar de Mazarredo, called on Beijing to open its market and level the playing field to close the “substantial” trade gap between the two countries. The Ambassador added: “The Belt and Road projects are contributing to the Spanish economy, but we have problems in our trade balance with China. We would like to find ways to solve it, but I don’t think the Belt and Road is a way to solve that problem.” Dezcallar stressed that the EU was “not a secondary player” and would walk its own path independent of Washington. The path for Europe was to have “good communication” with China in continuing to negotiate over their differences. Following the EU-China Summit, Premier Li Keqiang paid a visit to Croatia and attended the 16+1 Summit of 11 Central and East-European EU member states and five Balkan countries. Greece was accepted as a new member of the China-CEEC cooperation platform at the meeting in Dubrovnik, co-chaired by Premier Li Keqiang and Croatian Prime Minister Andrej Plenkovic. Li Keqiang said that China is willing to expand imports of goods from CEE nations, particularly agricultural products that cater to the demand of Chinese consumers. Trade of farm goods, machinery and electric devices should be further boosted and logistics sped up between the trading partners, he added. 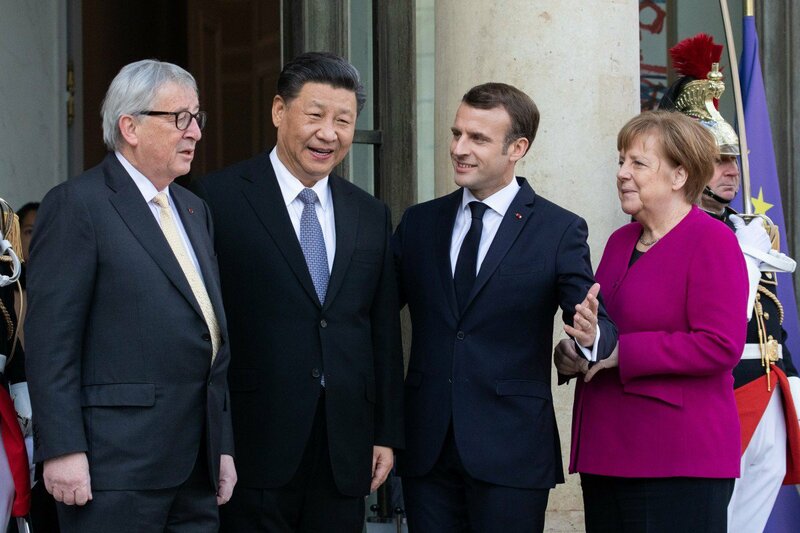 At the end of his visit to Italy, Monaco and France, Chinese President Xi Jinping met in Paris with French President Emmanuel Macron, German Chancellor Angela Merkel and European Commission President Jean-Claude Juncker. European and Chinese leaders sought to reassure each other over economic cooperation despite the increasing U.S. move towards protectionism, and EU leaders told Xi they were still open to joining China’s “Belt and Road Initiative”. Xi said China was determined to protect the world’s multilateral system, and was ready to continue with “opening up”. He also invited European countries to join the Belt and Road scheme – which Washington has characterized as a Chinese “vanity project”. Europeans still wanted to participate in the BRI. The visit took place amid growing European skepticism about China’s influence and follows a decision by the EU to brand China a “systemic rival” in a policy paper earlier this month.“We understand that China does not like the expression ‘rivals’, but it is a compliment describing our shared ambitions,” Juncker told a press conference. French President Macron said the four leaders had discussed “friendship” as well as “existing rivalries” between the EU and China and agreed to seek a “trust-based partnership. Our common will is to avoid new trade conflicts and isolationist policies,” Macron said. But a few days before meeting Xi, Macron said that “the period of European naivety is over,” and that letting Chinese companies buy up EU infrastructure such as ports had been a “strategic error”, the South China Morning Post reports. Through agreements signed in Rome, Italy became the first of the Group of Seven industrialized nations and the first founding EU Member to participate in the Belt and Road Initiative (BRI). 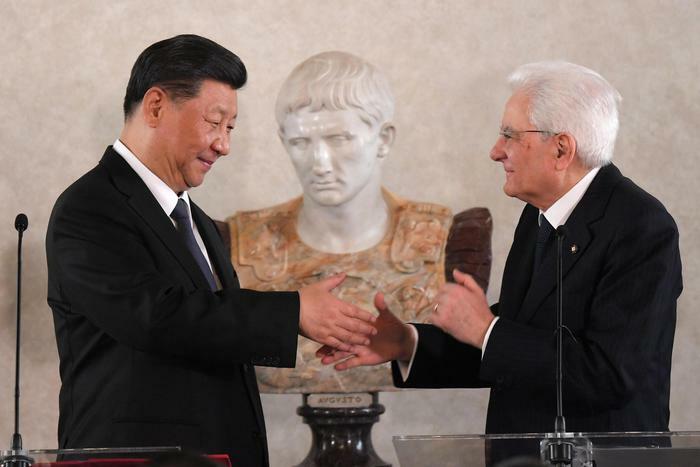 China stands ready to work with Italy on the BRI by strengthening its alignment with the country’s development strategies to bring bilateral ties to a new level, President Xi Jinping wrote in an article in the Italian newspaper Corriere della Sera ahead of his trip. He called on the two sides to tap more potential for partnership in port logistics, shipping, energy, telecommunications and medicine. Italian Prime Minister Giuseppe Conte and Chinese President Xi Jinping witnessed the signing of a memorandum of understanding on the BRI. Among the 29 other agreements signed were two port management deals between China Communications Construction and the ports of Trieste and Genoa, Italy’s biggest seaport. Trieste is strategically important for China because it offers a link from the Mediterranean to landlocked countries such as Austria, Hungary, the Czech Republic, Slovakia and Serbia, all of which are markets Beijing hopes to reach through its BRI. Other deals signed cover areas including satellites, e-commerce, agriculture, beef and pork imports, media, culture, banking, natural gas and steel. The two countries also agreed to boost cooperation on innovation and science, increase bilateral trade and set up a Finance Ministers’ dialogue mechanism. Bilateral trade topped USD50 billion last year while two-way cumulative investment reached more than USD20 billion. China’s “Belt and Road Initiative is a train that Italy cannot afford to miss”, said Italian Finance Minister Giovanni Tria. Prime Minister Giuseppe Conte also thinks Italy should jump on board, saying the multibillion-dollar Chinese infrastructure plan is “an opportunity for our country”. “The New Silk Road must be a two-way street to share not only goods but also talent, ideas, knowledge, forward-looking solutions to common problems and projects for the future,” Italian President Sergio Mattarella said. By March 6, more than 20 European countries had already signed BRI cooperation documents with China, including Russia, Portugal, Austria, Greece, and 16 Central and Eastern European countries. Chinese President Xi Jinping visited Italy, France and Monaco from March 21 tp 26. Xi’s visit coincided with the 55th anniversary of the establishment of China-France diplomatic relations. It was Xi’s first overseas trip this year, including the first visit by a Chinese President to Monaco. Following his short visit to Monaco, President Xi arrived in Nice and had dinner with French President Emmanuel Macron in Beaulieu-sur-Mer on the French Riviera before the official welcome ceremony at the Arc de Triomphe in Paris, and a meeting and state dinner at the Elysée presidential palace. President Xi also met in Paris with German Chancellor Angela Merkel and European Commission President Jean-Claude Juncker. During Xi’s visit, Airbus signed a USD35 billion contract for 290 A320 planes and 10 of the larger A350s in a blow to rival Boeing, whose 737 Max-8 is still grounded following two crashes in five months. The Airbus contract was one of 15 signed, including a €1 billion contract for EDF to build an offshore wind farm in China. France’s Fives and the China National Building Materials Group signed a €1 billion deal to cooperate on energy savings in developing countries. CMA-CGM and the China State Shipbulding Corp. signed a €1.2 billion deal to build 10 container ships. Chinese State Councilor and Foreign Minister Wang Yi has also just concluded a visit to EU Headquarters in Brussels for talks with EU High Representative for Foreign Affairs and Security Policy Federica Mogherini and to participate in the Ninth China- EU High-Level Strategic Dialogue. Wang underlined three points. Firstly, cooperative partnership is the nature of China-EU relations. There is no essential conflict of interest between China and the EU. Secondly, the goal of China-EU cooperation is to achieve mutual benefit and win-win outcome, where Europe will benefit from the new round of Chinese reform and opening-up. Thirdly, respect of each other’s core interest is essential for the trust between China and the EU. Minister Wang Yi also met the Foreign Ministers of the 28 EU Member States during an informal working lunch. The European Union and China have committed to a comprehensive strategic partnership. Yet, there is a growing appreciation in Europe that the balance of challenges and opportunities China presents has shifted. The European Commission and the High Representative aim to start a discussion to refine Europe’s approach to be more realistic, assertive and multi-faceted. China is simultaneously a cooperation partner with whom the EU has closely aligned objectives, a negotiating partner, with whom the EU needs to find a balance of interests, an economic competitor in pursuit of technological leadership, and a systemic rival promoting alternative models of governance. The EU aims to exert more leverage for its objectives in full unity. EU Commission Vice President Jyrki Katainen said the EU is now putting forward concrete proposals on how to strengthen its competitiveness, ensure more reciprocity and a level playing field, and protect its market economy from possible distortions. • Based on clearly defined interests and principles, the EU should deepen its engagement with China to promote common interests at the global level. • The EU should robustly seek more balanced and reciprocal conditions governing the economic relationship. • Finally, in order to maintain its prosperity, values and social model over the long term, there are areas where the EU itself needs to adapt to changing economic realities and strengthen its own domestic policies and industrial base. 1. The EU will strengthen the EU’s cooperation with China to meet common responsibilities across all three pillars of the United Nations, Human Rights, Peace and Security, and Development. 2. In order to fight climate change more effectively, the EU calls on China to peak its emissions before 2030, in line with the goals of the Paris Agreement. 3. The EU will deepen engagement on peace and security, building on the positive cooperation on the Joint Comprehensive Plan of Action for Iran. 4. To preserve its interest in stability, sustainable economic development and good governance in partner countries, the EU will apply more robustly the existing bilateral agreements and financial instruments, and work with China to follow the same principles through the implementation of the EU Strategy on Connecting Europe and Asia. 5. In order to achieve a more balanced and reciprocal economic relationship, the EU calls on China to deliver on existing joint EU-China commitments. This includes reforming the World Trade Organization, in particular on subsidies and forced technology transfers, and concluding bilateral agreements on investment by 2020, on geographical indications swiftly, and on aviation safety in the coming weeks. 6. To promote reciprocity and open up procurement opportunities in China, the European Parliament and the Council should adopt the International Procurement Instrument before the end of 2019. 7. To ensure that not only price but also high levels of labor and environmental standards are taken into account, the Commission will publish guidance by mid-2019 on the participation of foreign bidders and goods in the EU procurement market. The Commission, together with Member States, will conduct an overview of the implementation of the current framework to identify gaps before the end of 2019. 8. To fully address the distortive effects of foreign state ownership and state financing in the internal market, the Commission will identify before the end of 2019 how to fill existing gaps in EU law. 9. To safeguard against potential serious security implications for critical digital infrastructure, a common EU approach to the security of 5G networks is needed. To kickstart this, the European Commission will issue a Recommendation following the European Council. 10. To detect and raise awareness of security risks posed by foreign investment in critical assets, technologies and infrastructure, Member States should ensure the swift, full and effective implementation of the Regulation on screening of foreign direct investment. The Joint Communication will be presented to the European Council on 21-22 March. The next EU-China Summit is scheduled for April 9, the EU Commission communicated in its press release. This week, Chinese Foreign Minister Wang Yi will attend the ninth China-European Union High-Level Strategic Dialogue in Brussels and President Xi Jinping will visit Italy and France.